Please let us know your choice when you book, or contact us for more information about the areas. The maximum people per group is 8, the minimum is 1 person. 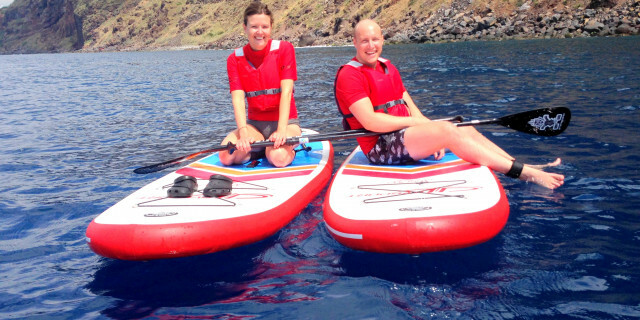 While available to all levels of experience (beginners to advanced), some beginners may find the length of paddling difficult. Please consider your fitness level, or contact us for advice. 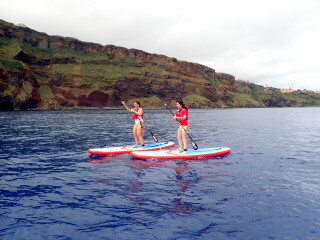 While we don't usually associate fun and traveling with a 'core workout', this day of stand up paddleboarding checks all the boxes. 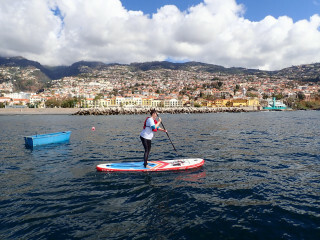 As you move through blue waters along Madeira's panoramic seaside, prepare for a bit of a workout, and definitely a few slips and falls. That's part of the fun! 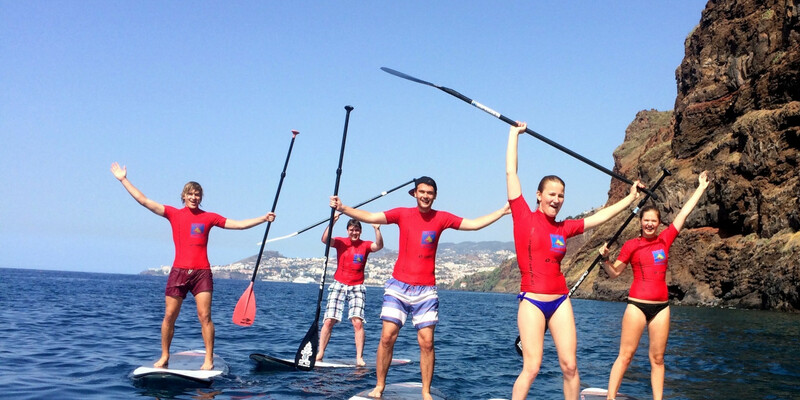 After being brought to your preferred location, our instructor provides all necessary equipment and safety tips. 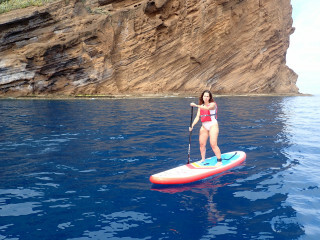 While a full day of paddling is best if you have some experience, beginners are absolutely welcome. Our guide explains all the basics, like how to find the perfect balance that keeps your board's nose and tail out of the water. After some practice on land builds our confidence, we're ready to go. We enter the water at our smooth entry point, protected from wind and waves but exposed to sweeping views of the endless horizon and stunning ocean rocks. Fish race by our feet, welcoming us on our adventure. Beginners can follow the patient guidance of our instructor, while those who have done this before can push ahead as swiftly as they like. 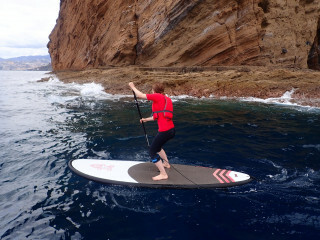 For half of our five hours of paddling, we navigate the sea, passing streams and waterfalls trickling down the green-covered rock formations. 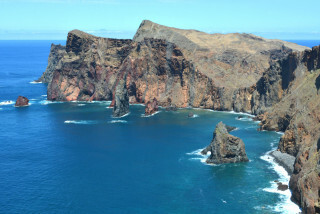 You explore the waters of Madeira in the area of your choice. 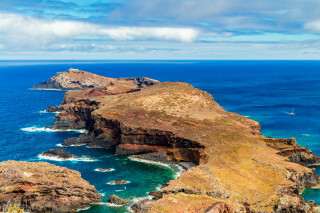 You can begin your experience in Funchal, a city located on the sunniest coast of Madeira facing the beautiful Atlantic, with a backdrop of dramatic mountains. Your second option is starting in Jardim do Mar, a small town filled with colorful wildflowers and steep cliffs. Or you can choose to begin in Caniçal, a little fishing village with one of a few sandy beaches protected from winds by a valley. 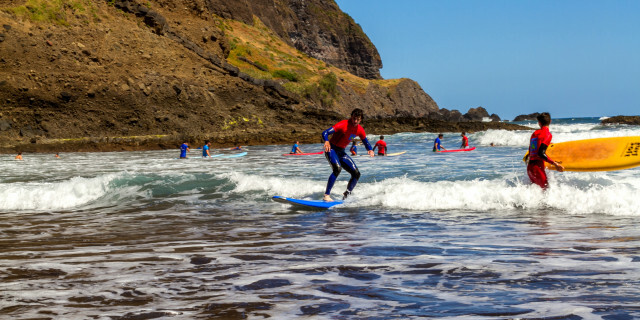 Your final option is Porto Moniz, a charming little town on the northwestern tip of Madeira, where we find seawater lava pools naturally filled by the Atlantic's high tide. Around noon, we rest our legs with a welcomed lunch break in the sunshine. Then it's back to exploring the island that holds surprises at every pivot of your board. 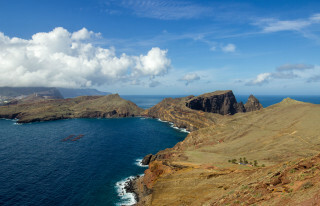 Seeing Madeira from a seafaring point of view as you test your endurance is a unique, rewarding combination that is sure to satisfy all senses.